Notes: United for Wildlife is one of many projects created by The Royal Foundation of The Duke and Duchess of Cambridge and Prince Harry. Led by The Duke of Cambridge and with the help of ambassadors from around the world and key partner organisations, it unites the world’s leading wildlife charities under a common purpose: to create a global movement for change. To coincide with the issue of this Royal Mail stamp sheet, I have designed this stunning pair of covers. These will not be numbered and only available on a pre-order basis. 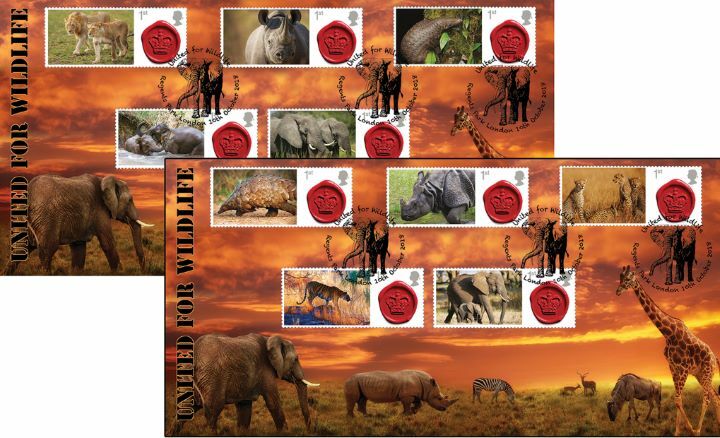 The above Royal Mail United for Wildlife [Commemorative Sheet] stamps were issued on 10 October 2018 by Royal Mail and feature the following stamp designs: 1st Crown plus Wildlife labels. The Wildlife in Africa- Pair of Covers first day cover with the London, Elephant, Special Handstamp postmark has been produced by Bradbury and features these stamps which can make a very collectible and lovely gift.